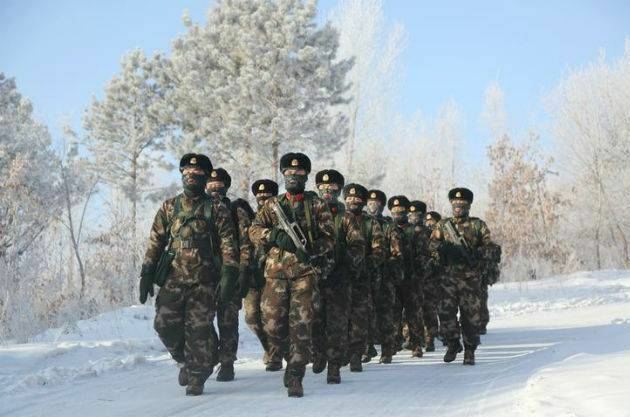 (TibetanReview.net, Mar15’16) – After needling India through repeated covert intrusions across its Ladakh borders from occupied Tibet, the Chinese People’s Liberation Army (PLA) has now sent senior army officers to forward posts opposite the Nowgam sector in North Kashmir, reported India’s PTI news agency Mar 13. The report cited sources as saying some intercepts of communications involving Pakistani army officers suggested that the Chinese troops had come to create some infrastructure along the LoC (line of control). The report said though the Indian army had officially maintained complete silence on the issue, they had been constantly updating various intelligence agencies about the presence of PLA troops along the Line of Control. The report said PLA troops were first spotted in the later part of 2015 and ever since their presence was witnessed opposite Tangdhar sector as well. This is the area where Chinese government-owned China Gezhouba Group Company Limited has been building a Jhelum-Neelum 970 MW Hydel power project. The intercepts were also reported to suggest that Chinese PLA would be digging some tunnels in Leepa Valley, located in Pakistan-occupied Kashmir (PoK), to build an all-weather road which will serve as an alternate route to reach the Karakoram Highway. Experts are said to see the visit by PLA officials as part of Beijing’s 46 billion dollar China-Pakistan-Economic Corridor (CPEC) under which Gwadar port in Karachi is linked to the Chinese-ruled Xinjiang territory through Karakoram highway, an Indian area under illegal occupation of China. Last year, as the CPEC project was given final shape, India had registered its protest against the presence of Chinese troops in Gilgit and Baltistan, an area in PoK, saying that it was unacceptable. Chinese officials have maintained that CPEC was an economical package to link Asia with Eurasia. Srikanth Kondapalli, Professor in Chinese Studies at Jawaharlal Nehru University, who has been part of think-tank on Indian policy towards China, sees a Chinese game plan in play in the recent developments in the PoK. He has said China was going to raise three divisions of its PLA under a local name in PoK to guard Chinese interests in occupied Kashmir. The new divisions, with around 30,000 troops, will be deployed in and around the installations built by the Chinese firms, so that Beijing could also justify its presence along the LoC in northern part of Kashmir, the report added.